Biological Morocco grown Quinoa® by the Farmers of Morocco. these super delicious ​Almond-Cranberry Quinoa Cookies​. The sweet and chewy snacks have around 200 calories with 3 grams of fiber and 5 grams of protein per serving. Ingredient info: White whole wheat flour and quinoa can be found at better supermarkets and at natural foods stores. Preheat oven to 375°F. Line 2 baking sheets with parchment paper. Whisk flour, salt, baking powder, and baking soda in a medium bowl. Using an electric mixer, beat butter, both sugars, and honey in a large bowl until light and fluffy, about 3 minutes. Add eggs and extracts; beat until pale and fluffy, about 2 minutes. Beat in flour mixture, 1/2 cup at a time. Stir in quinoa, oats, cranberries, and almonds. Spoon dough in 2-tablespoon portions onto prepared sheets, spacing 1″ apart. Bake cookies until golden, 12-15 minutes. Transfer cookies to a wire rack and let cool. DO AHEAD: Store cooled cookies airtight at room temperature for 1 day, or freeze for up to 1 month. TOTAL TIME for this recipe : 25 min. In a small saucepan, bring water to a boil. Add quinoa. Reduce heat; cover and simmer for 12-15 minutes or until liquid is absorbed. Remove from the heat; fluff with a fork. In a large skillet, saute onion in oil until tender. Add garlic; cook 1 minute longer. Add tomatoes and green chilies. Bring to a boil over medium heat. Reduce heat; simmer, uncovered, for 10 minutes. Stir in quinoa and artichoke; heat through. Sprinkle with cheese. Yield: 4 servings. For more Quinoa recipes click here. Rinse the quinoa and drain well. Put the quinoa in a dry pan and set on fire. Stirring leaves you dry quinoa. When the quinoa as well as dry you pour a little olive oil and stir through. Toast the quinoa in about 10 minutes until crisp and golden. Stir occasionally intervening to make the quinoa cooks evenly and puffs and prevent burn in this way. When you hear the quinoa literally puffing you know that the quinoa is ready. Taste it first cautious one and if you quinoa crunchy and delicious than you spoon the quinoa on a plate and let cool. 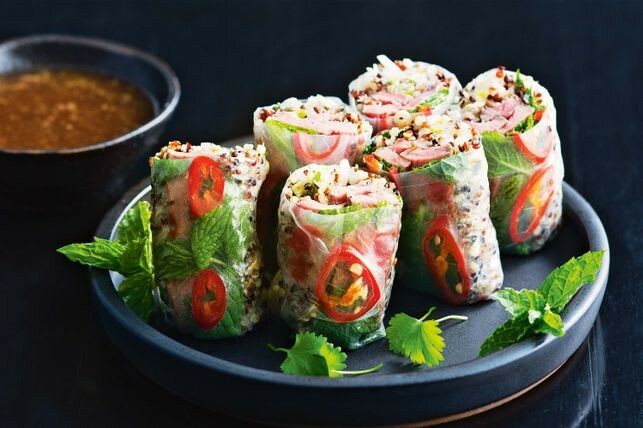 Create a kaleidoscope of color and flavor with these rice paper rolls which are gluten free, low in fat and kilo-joules. Place MoroccoQuinoa® and 185ml (3/4 cup) water in a saucepan over medium-low heat. Bring to a simmer. Simmer, stirring, for 10-12 minutes or until quinoa is tender. Cool slightly. For sauce, place sugar, fish sauce, tamarind, garlic and remaining water in a saucepan over medium-low heat. Cook, stirring, for 3 minutes. Simmer for 2 minutes or until thickened slightly. Transfer to a bowl. Stir in juice and ginger. Cool. Heat a chargrill over medium-high heat. Spray steak with olive oil. Season. Cook, turning, for 4 minutes for medium or until cooked to your liking. Rest for 4 minutes. Thinly slice. Stir shallot and 3 tsp sauce into quinoa. Dip 1 rice paper sheet in cold water for 10 seconds or until starting to soften. Drain on a clean tea towel. Place on a work surface. Place 2 chilli slices and a mint leaf along centre. Top with a little quinoa mixture, bean sprouts, steak and coriander. Fold in ends. Roll up firmly to enclose filling. Repeat with remaining sheets. Serve with the remaining dipping sauce. For a tasty Asian dressing, combine a little of the leftover tamarind with lemon juice, fresh lemongrass, brown sugar and fish sauce. Author: Katrina Woodman. Image credit: Jeremy Simons. Quinoa, the sacred “mother grain” of the ancient Inca civilisation suppressed by Spanish conquistadors, could become an increasingly important food source in the future thanks to genetic secrets revealed in a new study. Scientists said they have mapped the genome of quinoa and identified a gene that could be manipulated to get rid of the grain’s natural bitter taste and pave the way for more widespread commercial use. Quinoa already grows well in harsh conditions such as salty and low-quality soil, high elevations and cool temperatures, meaning it can flourish in locales where common cereal crops like wheat and rice may struggle. But the presence of toxic and bitter chemicals called saponins in its seeds has been one of the impediments to extensive cultivation. Plant scientist Mark Tester of King Abdullah University of Science and Technology in Saudi Arabia said the research pinpointed a gene that guides production of saponins in quinoa. This knowledge could enable breeding of quinoa without saponins, to make the seeds sweeter. Currently, quinoa grain must be processed through washing and drying after harvest to remove saponins. Increased quinoa production could improve food security on a planet with unrelenting human population growth, Tester said. There are potential disadvantages to reducing saponins, perhaps increasing susceptibility to fungal infections or bird predation, Tester added. ACTIVE TIME 45 mins. TOTAL TIME 55 mins. YIELD Serves 8 (serving size: 1 1/3 cups). How to Make It Preheat oven to 325°F. Spread quinoa in a thin layer on a rimmed baking sheet; bake at 325°F until browned, about 30 minutes, stirring every 10 minutes. Heat a large stockpot over medium. Add oil. Add onion, carrot, bell pepper, and garlic; cover and cook 10 minutes or until vegetables are tender, stirring occasionally. Uncover and stir in rosemary and cumin; cook 1 minute, stirring constantly. Stir in stock, potatoes, celery root, and toasted quinoa. Increase heat to high; bring to a boil. Cover and reduce heat to medium; cook 12 minutes. Stir in zucchini and Brussels sprouts; cook until vegetables and quinoa are tender, about 2 minutes. Stir in parsley and salt. Cook ½ dry quinoa in 1 ½ cups of water until the quinoa is nice and fluffy about 15 minutes. Combine the milk with the vinegar and set aside for a few minutes. Meanwhile sift all the dry ingredients into a large bowl and combine. In the bowl with the milk add the maple syrup, vanilla and oil and stir well. Add the quinoa to the dry ingredients and combine the liquids with the dry ingredients and mix. Heat a pan with vegan butter or coconut oil and drop 3 tbsp worth of batter into the pan. Cook until bubbles form on the top and the sides turn brown, then flip and cook for another minute on medium heat. Serve on a plate and drizzle with syrup if you like.